The installation exists of two part: a server part and a client part. The manual tells <nadrukkelijk> to start directly the setup.exe (not using Add/Remove Programs). During the installation you only need to specify the installation directory and pressing a couple of time the next button. 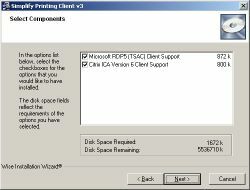 The client installation is almost exactly the same story, you only need to can specify which protocol(s) (RDP or ICA) need to be supported. On both sides (client and server) several configuration settings can be set. It is a pity that the settings need to be set per client or server (although we see al the settings back in the registry). On the server Simplify Printing is placed in the control panel, where it of several tabs. 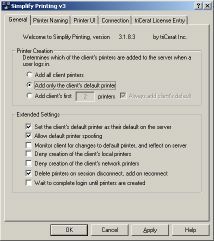 On the first tab several options can be found concerning the autocreation of the client printers. We like the options to specify that client and/or network printer may be created and the option to allow printer spoofing (selecting a other default printer on the Terminal Server as on the client system). In the second tab you can specify in which way the names should be showed to the user. Within the third tab configuration settings are mad which options are available to the user on Terminals Server. The connection tab specification are set up about the bandwidth print jobs may use, specified using the RDP or ICA protocol. A nice feature is that is is possible to let the user on their client to select a lower bandwidth. 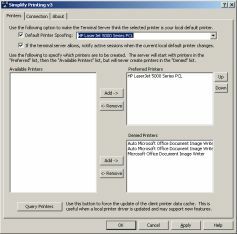 Simplify Printing automatically uses his own universal print driver. Tricerat did not build in any management information in Simplify Printing. To be honest we could not think of very useful data to monitor or reporting. Only for troubleshooting purposes it would be nice that some debug information is available. What is the difference for user in comparison with auto creation of Microsoft or Citrix? User now have a control panel applet where they can arrange their printer setting for the Terminal Server environment. They can choose which printers need to be connected to the Terminal Server and which printer will be the default printer (printer spoofing). If allowed they can choose to change their bandwidth availability for printing. Simplify Printing is a pretty basic add-on which solves the biggest problem on Terminal Server, drivers issues by using their own universal drivers. In all these kind of solutions you need to have a piece of client software on the client system. Configurations are pretty basic, although we like the printer spoofing and the bandwidth control for print jobs. Simplify printing is only a solution if you use client printer mapping, it is a pity that there is no special feature for printer servers.